Eastern and Northern winds continue to bring considerable wet weather for the UK as the country can expect showers and gloomy overcasts for the beginning of the weekend with periods of sunshine. Meteorologist Aidan McGivern said: “More November gloom to come for many parts of the country, especially during Friday morning and there will be plenty more showers coming in some places. 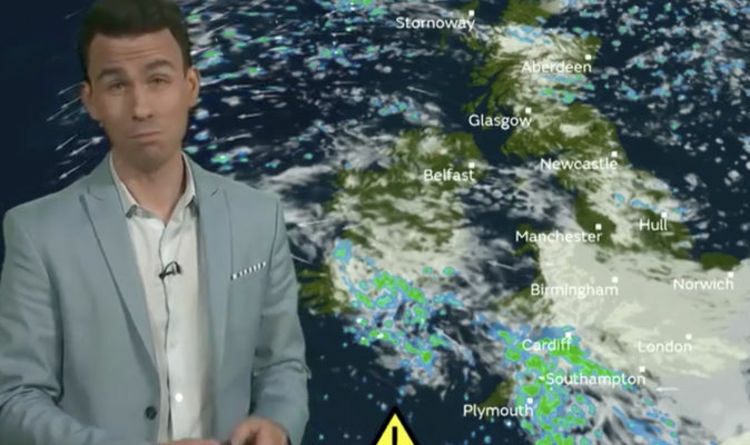 “Across the northern half of the country, we have got easterly winds which means there will be more showers coming in across central and eastern parts of Scotland in particular with a lot of clouds to contend with. “A slice of brightness for Northern Ireland, southwest Scotland northwest England. There will be thick overcast skies across eastern parts of Wales, the Midlands, East Anglia, and the southeast. Mr McGivern continued: “There will be further showers through Scotland through the day. “In the southwest, there will be an increasing sight of heavy downpours initially through Friday daytime. “Through Friday evening those showers will push north and east. These showers will become well spread through to south Wales, Cornwall, Devon, Dorset, and Gloucestershire. The Met office Meteorologist then explained the intense weather to be expected in the southwest. He said: “These heavy downpours will become generally wet weather across the southwestern area and they will be accompanied by gusty winds, some hail, some thunder, some lightning. “It's going to be a lively night that could cause some issues because we will see 20-40mm of rainfall accumulating through Friday and Saturday. with a rain warning in force because of issues potentially form this amount of rainfall. “Elsewhere it will be a quieter start to Saturday but there will be a lot of gloomy skies for central parts of Wales and the Midlands but some spots of sunshine for western Scotland, Northern Ireland, and Northwest England.